Woodblock demo starts in less than one hour at MCBA! 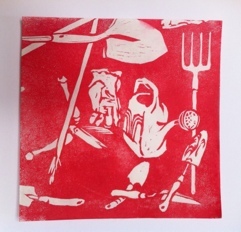 I’m heading to the Minnesota Center for Book Arts to demonstrate woodblock printing from noon to 1:30 this afternoon. It’s also the first day of the Shin Jidai exhibition including work by Jane Rosemarin and me. This entry was posted on Saturday, May 19th, 2012 at 4:13 pm	and is filed under Teaching. You can follow any responses to this entry through the RSS 2.0 feed. You can leave a response, or trackback from your own site.